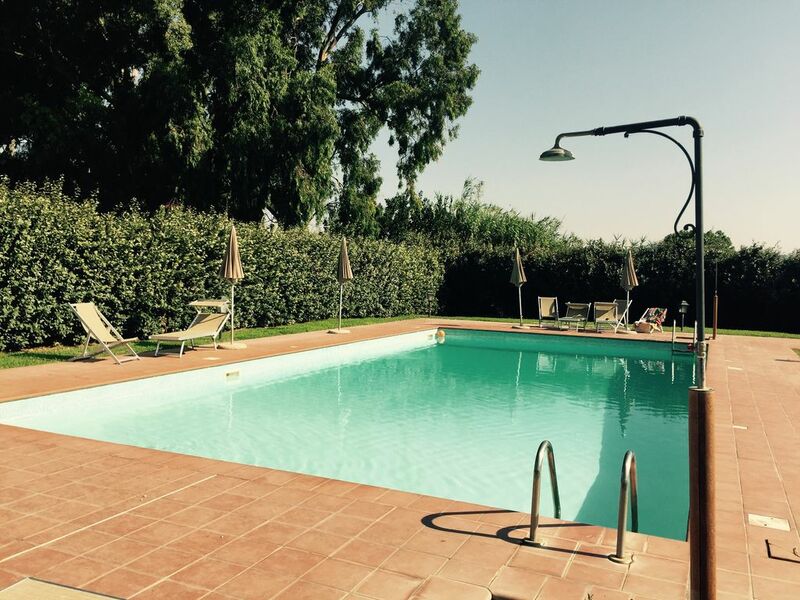 This is part of a typical Maremma barn, equipped with a tastefully furnished open-plan attic, and set in a beautiful residence with a swimming pool in the countryside, just 4 km away from the sea facing Lake Burano. It is a quiet and relaxing location, also ideal for children. There are 2 bedrooms, 2 bathrooms and an open-plan attic with more beds. The fully-fenced residence offers beautiful gardens and a swimming pool, which is secured. Near Saturnia, Pitigliano, Argentario. Rome is just 1 h away by car. Hi everyone! My name is Barbara and I live in Arezzo, Tuscany. I have been going to Capalbio for 20 years. This is a magic place, just like the entire Maremma region, because it is far away from the chaos, and covered in nature. I decided to rent our house, because, due to my working schedule, I do not go there too often. The residence is very quiet and relaxing. It is set in a countryside location, yet not isolated. The well-kept property features a wonderful swimming pool. The house is the last part of an old barn, which is why its ceilings are very high and decorated with typical huge Tuscan beams. The handmade terracotta floor is amazing, and the attic on the upper floor is an open-plan room, ideal for children: we know they love to have large spaces for playing and sleeping! Here, there are two master bedrooms and a small bathroom. On the ground floor, there are two bedrooms, a living room, and a kitchen opening onto the main garden, which features a canopy covered by a big tree. Outside you can rest in the hammock and have a lunch or dinner. We spent 2 weeks with our 3 kids in this house in Summer 2018. The Apartment is clean and has enough space for 5 persons. The kitchen has everything you need. Outside there is a nice backyard with a big table where we had breakfast and lunch in the shadow. The pool is very clean and quite big. Even there are more apartments we were nearly always alone at the pool. The area is very calm and peaceful. Next to the house there is a very nice restaurant and yes you hear sometimes in the evening a little bit the sound of the restaurant, but we never felt annoyed. The next supermarket can be reached within 4 minutes, the small village of Capalbio Scalo in 5 minutes with small shops, bakery, restaurants and bars to enjoy an espresso. Barbara was always available and helped very quickly, if there have been any problems or questions. The next beach can be reached within 10 minutes by car. In total we had very nice vacations this summer. You should bring a moskito net for the nights or you accept some bites. hello Daniel, thank you for your nice words! I am very happy that you and your family had a nice stay in my house , I hope to be as hospitable as possible every time to make my guests feel better and better! Der Urlaub hat uns sehr gut gefallen. Die Anlage wird hauptsächlich von Italienern genutzt, weshalb in der Woche auch sehr wenig los war. Die meiste Zeit hatten wir den sehr schönen und großen Pool für uns. Man sollte sich nur darüber im Klaren sein, dass Poolregeln existieren. Solange niemand da war, den es gestört hat, war das o. k. In der zweiten Woche gab es leider Beschwerden, weil unsere Kinder vom Beckenrand gesprungen sind und die Mittagsruhe nicht eingehalten haben. Auch hört man die Geräusche von neben an gelegenen Restaurant, wenn man abends auf der Terrasse sitzt, was uns aber nicht gestört hat. Einziges Manko: ein zweites vollwertiges Badezimmer mit Dusche wäre prima gewesen. Hier ist man aufgrund der wenigen Städtchen in der Nähe wirklich in der Maremma angelangt - was mir seehehr gefiel. Das Haus ist super dekoriert/eingerichtet und hatte alles. Das es eng war wussten wir und störte uns nicht. Der Sitzplatz war ausser der obgenannten Geruchsangaben gross. Die Anlage ist sehr gepflegt. Die andere Familie störte sich daran, dass es nirgendwo einen Ausblick aus der Anlage gab: keinen Horizont, keine Maremma, keinen Sonnenuntergang, da die Hecke sehr hoch und dicht um die ganze Anlage angelegt ist, was einem aber einen sehr mondänen Eindruck gibt und wohl auch Sicherheit. We had a wonderful time in the little village CapAlbio. You could make a day trip to roma, a bootstrip around monte argentario or go out for dinner (right next to the house) in the restaurante "selva nera". Thank you Babara (owner) for your help! Das Appartement bietet alles was man für einen unbeschwerten Urlaub brauch. Die Galerie im oberen Bereich ist urig und sehr gemütlich, die unteren Zimmer leiden ein bischen am Straßenverkehr. Angenehm der schnelle weg zum Pool. Die Appartementsanlage ist abgesichert und nur durch ein elektronisches Tor zu befahren. Wir haben uns sehr wohl gefühlt. Proprietà ben arredata e fornita di tutto il necessario. Suggestivo il portico esterno. È situata in un luogo molto tranquillo ma nello stesso tempo vicina sia al mare sia a località di grande interesse. Piacevole lo spazio piscina. The apartment is situated in Selva Nera, facing Lake Burano in a countryside area, very close to the main village of Capalbio Scalo. The residence is well kept and features large shared outdoor places and a swimming pool, which is secured. The beaches are just 5 min away by car; they are well equipped with all main facilities. There also are kilometres of public beaches. Capalbio is a perfect starting point for visiting Argentario (15 km away), Saturnia (60 km away), Rome (70 km away), Isola del Giglio, Pitigliano, Manciano (40 km away), Tarquinia (10 km away), the Garden of Tarot (5 km away), Capalbio Scalo (3 km away), and Capalbio Alta (8 km away). Horse-riding, art, history, architecture and cuisine. Windsurfing, kiteboarding, and diving are available nearby. CAPALBIO Porzione di fienile maremmano con mansarda open space lussuosamente rifinito,in bellissimo residence con piscina in campagna a soli 4km dal mare di fronte al lago di Burano.pace e relax ideale anche per bambini.alla casa si accede da un cancello automatico che apre sugli spazi comuni composti da giardini curati e dalla bellissima piscina immersa nel verde con letti e ombrellini e sorvegliata da giugno a settembre da un assistente.la casa si trova nella parte finale del grande fienile e la proprietà gode di due giardini, il più grande arredato da tavolo panche amaca e barbecue,e uno piccolo sul retro di fronte a una delle camere.a casa si accede dal giardino grande ed entrando ci si trova un grande open space su due livelli, con cotto antico e travi , arredato in toni soft e con pezzi di artigianato africano. A piano terra abbiamo cucina, living con sala da pranzo, una camera matrimoniale, una camerina con divano letto matrimoniale, un bagno con doccia e due ripostigli con lavatrice . Al piano di sopra mansarda open space con pedana e futon 4 posti letto , oltre a un piccolo bagno di servizio. La casa è' ben attrezzata per la permanenza di bambini , si può usufruire di lettino e seggiolone ed è particolarmente indicata per la tranquillità, del residence, completamente recintato , la piscina sorvegliata e la campagna circostante. Nelle immediate vicinanze , l imbarazzo della scelta per il mare dell Argentario e le sue spiagge, la campagna maremmana, le terme di saturnia, i siti etruschi di Tarquinia e Cerveteri, il paese medievale di Capalbio, Pitigliano, il giardino dei tarocchi di Niky de Saint phalle, e la capitale, Roma a un ora di distanza. Le quote comprendono l affitto casa e l uso della piscina del residence, oltre al servizio giornaliero del giardiniere. Non è possibile soggiornare meno di tre quattro notti ma le tariffe possono cambiare a secondo dei periodi con sconti particolari per lunghe permanenze e accordi particolari con la proprietà.